ALBUQUERQUE, N.M. — Sandia researchers are sharing a four-year, $12 million Department of Energy research contract on the long-term geologic sequestration of carbon, considered a key element in reducing greenhouse gas emissions. The contract from the department’s Office of Science funds research by the Center for Frontiers of Subsurface Energy Security (CFSES), a joint carbon sequestration program led by the University of Texas, Austin. Sandia researchers will get $5.6 million of the total, which renews a five-year, $7 million contract awarded in 2009. The latest award was one of 32 Energy Frontier Research Center (EFRC) contracts chosen from more than 200 proposals. Upcoming work focuses on three technical challenges: sustaining large storage rates over decades; increasing efficient use of pore space in geologic formations, or reservoirs, where carbon dioxide (CO2) would be stored; and making sure it doesn’t leak from the reservoir, said Sandia geochemistry researcher and assistant center director Susan Altman. Marianne Walck, associate director for CFSES, who also heads Sandia’s Geosciences Research Foundation, said DOE’s funding renewal validates the work done by Sandia and the university in the program’s first five years and positions the center for major impact in subsurface storage research and development. “The technical and programmatic reviews of our proposal with UT were superb; they speak to the quality of research at both institutions,” she said. 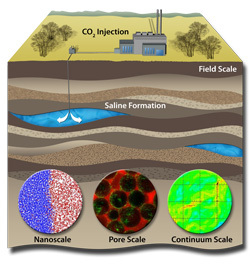 The effort concentrates on deep saline reservoirs, studying problems from the atomic to the full reservoir scale in a multidisciplinary approach that brings together chemistry, microbiology, geomechanics, geophysics and computer sciences. The team includes researchers from Sandia and the university’s Cockrell School of Engineering and Jackson School of Geosciences. The original EFRC contracts focused on multiscale, multiphysics processes to ensure safe storage of CO2 without harming the environment. Researchers now will work to integrate physics across length scales. For example, Altman said, they will look at the integrity of caprock, the low-permeability mudstone that helps keep buoyant CO2 underground. They also will study caprock at the atomic scale to see if there is significant storage space in the clay layers. At the core scale, researchers will measure the caprock’s mechanical properties to better understand how the rock could fracture under pressure. Then team members will integrate knowledge and measurements from the core scale to model the caprock itself — at the reservoir scale — to understand how fractures develop in the reservoir. The center also studies how CO2 dissolves into resident brines over time. During injection, CO2 is trapped by the caprock, which is critically important but the least secure of four trapping mechanisms. 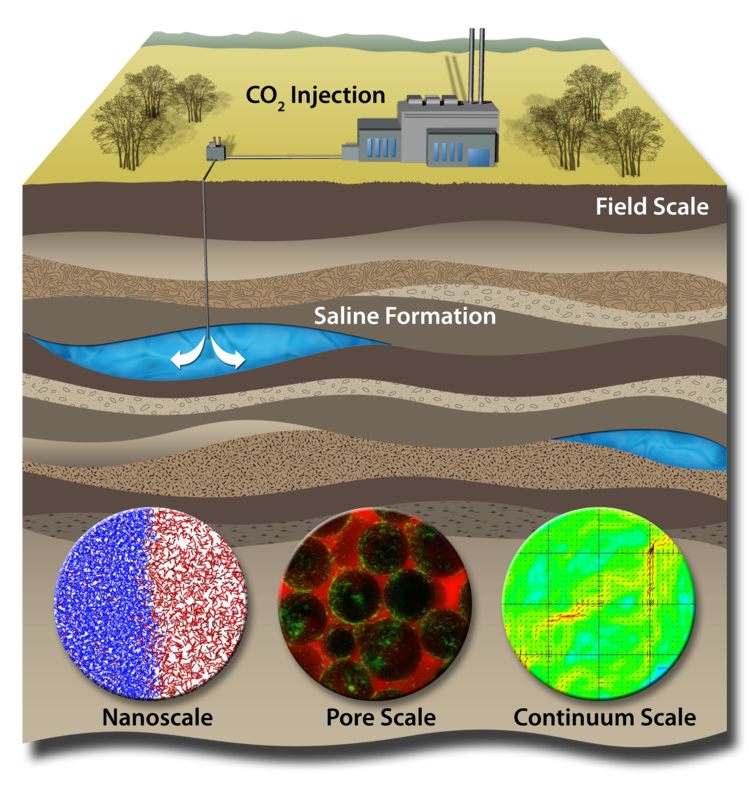 After that comes residual trapping, in which dispersed CO2 bubbles are caught in pore spaces; solubility trapping, when CO2 dissolves in the brine or other fluids underground; and finally mineral trapping, where carbon becomes a solid, such as calcite, which is the most secure mechanism but takes the longest, anywhere from a few years to thousands of years. Researchers also are working in the field at New Mexico’s Bravo Dome, a natural underground reservoir of trapped CO2. They’re trying to calculate long-term dissolution rates at the site to understand the importance of solubility to CO2 trapping, Altman said.